Ava Helen Miller (third from bottom) with her seven sisters. 1918. Ava Helen Pauling was born Ava Helen Miller on her family’s farm near Oregon City on December 24, 1903. At the time of her birth, Ava had nine siblings. Her father had come to the northwest from Germany in his teens, and was an elementary school teacher in the Willamette Valley before becoming a farmer. As a result, Ava later remarked that, while growing up, there was a great deal of respect in her family for the teaching profession. Her mother was born in Beaver Creek, Oregon to parents who had come to the west by wagon and on foot from Illinois and Missouri. The family later lived in Canby, Oregon, which is likely where Ava finished grammar school. Ava then attended high school in Salem while living with an older sister. 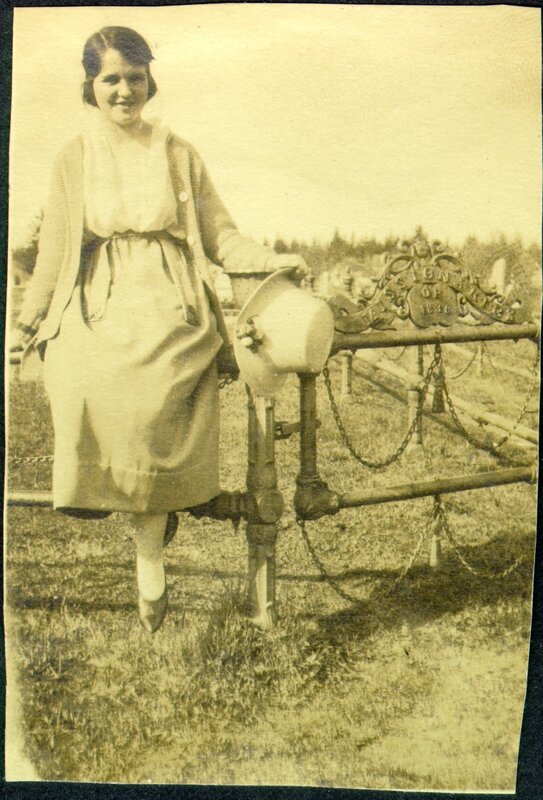 She graduated in June of 1921, and enrolled at Oregon Agricultural College in Corvallis the following year. During her time as an undergraduate student she took a great number of English, French and Spanish courses. She also took a chemistry class every term, as well as at least one course in physical education. Her home economics courses were more varied and included clothing and textiles, child care and food preparation and selection. Overall she did quite well, finishing with a 89.21 grade point average, and would have finished even higher had she not received an F in an English course during winter term of her freshman year. Ava Helen Miller at the entrance to the Jason Lee Cemetery, Salem, Oregon. 1920. In recitation room #211. Chemistry O.A.C. He was my teacher – a student assistant. His curls are lovely. Following their first meeting, it was some time before the two spent any more time together. An instructor had recently been severely criticized for the attention that he had paid to one of his students, and though Pauling was obviously quite taken with Ava from the beginning, he was determined not to endure the same fate. One day, however, a note came back to Ava in her chemistry notebook stating that if she waited after class, Pauling would walk across campus with her. The two walked, and then went for more walks, becoming better and better acquainted over the following months. By the end of the school year, Ava had written Linus a check for the amount of “My heart, my life, my love, my all.” The two wished to marry, but their mothers would not grant permission. Linus resumed working for the Oregon State Highway Commission the following summer while Ava stayed with her mother. During the summer Ava wrote Pauling at least 94 letters, receiving just as many in return. Ava resumed classes at O.A.C. the following autumn and Linus began his graduate studies at the California Institute of Technology. The two continued to write each other throughout the next year. It is apparent over the course of their exchange that, though they missed each other greatly, both managed to stay well-occupied during their time apart. Linus was working intently on his crystallographic research while overseeing classes and labs. Ava was busy keeping up with friends and her sophomore year classes. The two stayed close through their correspondence, and shared the daily workings of their lives. Ava sometimes sent Linus candy, and Linus sometimes sent Ava flowers. Above all however, they discussed the prospects of their marriage, and their eager anticipation of the time that they would be spending together in the future. 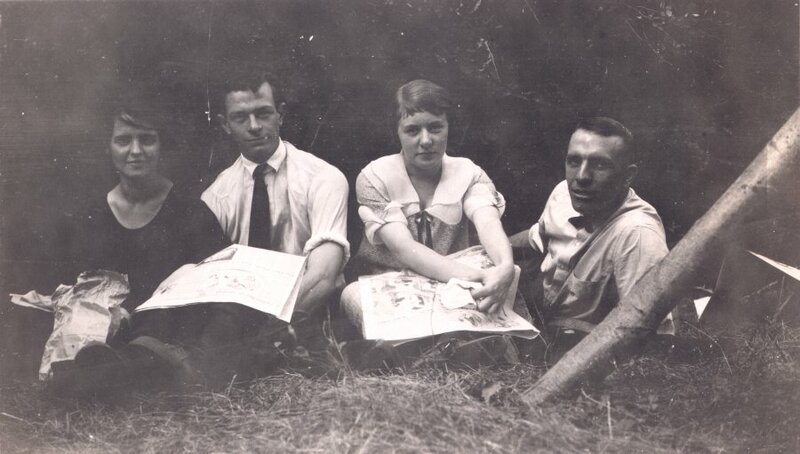 Ava Helen Miller and Linus Pauling with two O.A.C. classmates. 1922. Ava and Linus decided to marry following the completion of Linus’ first year of graduate studies, with or without the permission of their mothers. From the perspective of the young couple, they had already been engaged for over a year. They began discussing the details of their forthcoming wedding, informed relatives and purchased their rings. After waiting over a year longer than had initially been intended, Linus and Ava married in Salem, Oregon on June 17, 1923. The two would spend a brief honeymoon in Corvallis before moving to Portland over the summer. During those summer months, Linus worked for the Warren Construction Company. With the onset of autumn, the newlyweds returned to Pasadena, where Linus renewed his studies at the California Institute of Technology. For more information on the Paulings in Oregon, check out our Oregon 150 series.